"This recipe was passed down to me from my great aunt, it is easy, authentic and delicious! The secret to making these gnocchi is to dry the ingredients as much as you can before using. Let the ricotta drain of excess water by placing it in a strainer over a bowl and leaving it in the refrigerator for at least 30 minutes before using." Stir together the ricotta cheese, eggs, Parmesan Cheese, salt, pepper, and garlic powder in a large bowl until evenly combined. Mix in 1 cup of flour. Add additional flour if needed to form a soft dough. Divide the dough into 3 or 4 pieces, and roll into 1/2-inch-thick ropes on a floured surface. Cut each rope into 1-inch pieces, and place on a lightly floured baking sheet. Place in the refrigerator until ready to use. Heat olive oil in a saucepan over medium heat. Stir in garlic, and cook until softened and fragrant, about 1 minute. Pour in diced tomatoes and red pepper flakes; bring to a simmer over medium-high heat, and cook for 10 minutes. Stir in shredded basil and season to taste with salt and pepper. While sauce is simmering, bring a large pot of lightly salted water to a boil over high heat. Boil the gnocchi until they float to the surface, 1 to 2 minutes, then drain. To assemble the dish, stir the cubed mozzarella cheese into the sauce and allow the heat of the sauce to soften, but not melt the cheese. 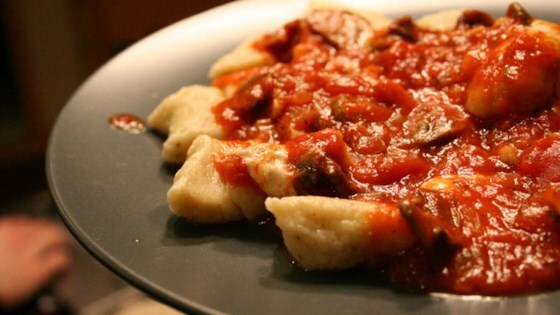 Place gnocchi into a serving bowl, and spoon sauce overtop. See how to make wonderfully light ricotta gnocchi with peas and mushrooms.